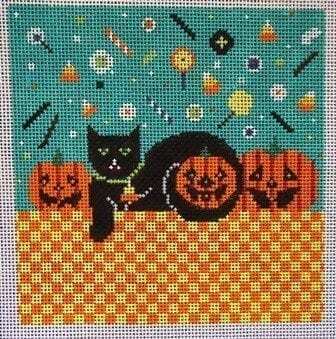 This happy black cat has everything she needs – three pumpkin friends and all the candy in the world! Her tail is curled around the happiest pumpkin and a candy corn sits in her left paw. A bright checkered bottom and aqua top sets off the falling candy which includes more candy corn, Licorice Allsorts, candy sticks, hard candy and lollipops. A Shelly Tribbey darling canvas, this is on 18 ct. and measures 5″ square.